While nail-biting in humans is often deemed a simple bad habit, the same behavior in dogs can mean something a bit more significant. Dogs are intelligent creatures that will perform a bit of self-grooming from time to time. However, continual biting may be an indication that your dog is uncomfortable or experiencing a health issue. Biting their nails may be the only way of alleviating the matter. If you notice your dog chewing or licking at their nails, you need to take action to prevent it from getting worse. The first step in taking care of unwanted nail-biting behavior is to identify the reason why they may be doing it in the first place. It's very easy to forget to get your dog's nails trimmed. For many owners, they know that its time when they start to get accidental scratches. However, it's important that you stick to a strict grooming plan to ensure that your dog's nails don't get out of control. Their nails grow relatively fast and can start to curve inward towards their paw. This will make walking and running a painful endeavor. Once your pooch starts to notice this discomfort, they may bite at their nails to take care of the problem for themselves. You may also notice significant pawing on the ground in an attempt to grind them down. It's best to perform the task for them or take them to a professional groomer. This will ensure that your dog's nails are even, smooth, and healthy. You should take your dog to get his nails trimmed on a regular basis to avoid overgrowth and chewing. Regular clippings will make the process easier in the long run as your dog will get used to the sensation. It'll also help to keep the quick down so that you can avoid unwanted bleeding. If you've ever broken a nail, you know how uncomfortable they can be to deal with. In most cases, people will just clip the broken piece off and be done with it. Dogs will do the same thing when their nails become damaged. Depending on the severity of the break, the issue could be causing them some significant pain. If that's the case, it's important that you use clippers to remove the broken portion instead of letting them bite it off. Bacteria in your dog's mouth can lead to a potentially dangerous infection. If your dog is suffering from breaks on a regular basis, they may be suffering from a condition known as Symmetrical Lupoid Onychodystrophy, or SLO. This issue can drive your dog crazy and requires medication to get under control. SLO is an autoimmune condition that causes their body to attack the nails. The immune system will treat the nails as a foreign invader, cutting off circulation and essential nutrients. As a result, they will start to break or lift off completely. Your poor canine companion doesn't know what's going on, so they'll start to intensely bite at their nails. If this occurs, you need to take your dog to the vet as soon as possible. A professional veterinarian will be able to diagnose the problem and set you up with an effective medication to control it. Dogs can experience allergies much like humans. The main difference is that they don't have the protection like we do. If your dog is allergic to anything outdoors, it will immediately transfer to their paws when they take a step outside. This can include anything from pollen to grass. Once contact is made, the skin on their paws may start to inflame and become itchy. 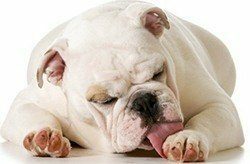 To combat that discomfort, your dog will start to chew their feet feverishly. In most cases, your furry friend isn't even aiming at the nails. They may be trying to get to the skin between the toes or on the paw. Their nails may just be getting caught in the fray. If left untreated, your dog can chew so much that they start to bleed. This can ultimately lead to unwanted infection. It's recommended that you take your pup to the vet for an allergy test and preventative plan. Infections have many of the same symptoms as an allergic reaction. Your dog's paws may become red, swollen, and itchy. In severe cases, you may even notice discharge at the infection site. Dogs can experience infections from a number of sources. They can become exposed to fungal infections from decaying wood or infested soil. With their penchant to dig in soil that smells, it's a fairly common occurrence. Bacterial infections can come from a number of sources, including bug bites. When an infection occurs, it can quickly spread. Your dog's paw is the prime environment for development. The area contains skin folds, doesn't get much sun exposure, and holds moisture. Luckily, infections are relatively easy to treat with the proper antibiotics. Many of the reasons why humans bite their nails are easily applicable to dogs as well. Dogs are complex creatures that experience the same wide range of emotions that we do. Dogs can start to bite their nails to deal with anxiety or nervousness. It's a way for them to deal with the problem and find comfort. Alternatively, they may be doing it just because they're bored. Either way, the nail-biting is a response to what they're feeling, so you need to address the issue head-on. In most cases, nail-biting is accompanied by other unwanted behavior. This may include chewing on items throughout the house, incessant barking, and accidents. Typically, nail-biting happens after you've locked them in a crate or when you've left them alone for the day while you go to work. It's a good idea to supply them with things that can take up their time and keep them entertained. There are many great toys available that are designed to stimulate their minds and prevent boredom or anxiety from occurring. If your dog is only chewing their nails every once in a while, it's usually not a cause for concern. It's only when it becomes a lasting problem that you need to intervene. If they are starting to bite their nails on a regular basis, you need to identify the cause of the issue and act accordingly. Your veterinarian will be able to help you find the underlying reasons and provide you with recommendations on how to make it stop. In most cases, addressing the main cause will put an end to the behavior. In the meantime, you may want to create a physical barrier to ensure that your dog can't chew on their paws. Inflatable collars or those that are used post-surgery can do wonders. It'll make it impossible for your canine companion to reach their paws. Of course, they'll still be uncomfortable, so you need to address the problem. 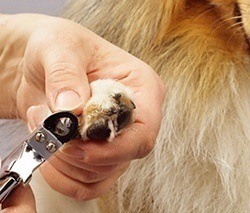 You can cut their nails and clean the area to provide some relief. Antiseptic soap and some warm water will do the trick. To prevent future issues, you need to dry the paw very well. You can use a drying power to get all the excess moisture out. Also Read: Can Dogs be Declawed?